Mint and Personal Capital are two of the most popular personal finance management apps available today. Both offer a free option to track your account balances, transactions, investments, and more with convenient dashboards offering you a quick summary of your finances at a glance. Each has its own unique strengths and weaknesses. If you are looking to simplify your finances and see everything from all of your accounts with one login, Mint and Personal Capital can both handle it. Read on to learn which may be better for your needs in the Mint vs Personal Capital competition. 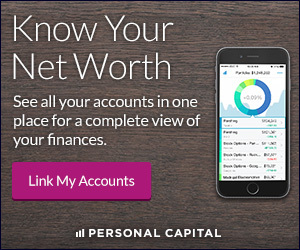 Personal Capital is both a free service for tracking net worth as well as an optional paid financial advisor service, which is how it makes money. Founded in 2009, Personal Capital not only keeps tabs on your accounts but also analyzes your investments and makes sure you're on track for retirement. Financial Advisory: an optional paid service, Personal Capital can help you manage your money and provide investment advice. Retirement Planning: this tool helps determine whether you are on track for retirement based on your current or anticipated financial situation. 401(k) Fee Analyzer: this tool helps you compound more by identifying which funds cost you the most so you can switch to lower-cost equivalents and improve your returns. No Ads: since Personal Capital makes money on the financial advisory side, they do not show ads. Mint is a free service for aggregating all of your financial accounts, such as checking and savings accounts, investment accounts, credit cards, and loans to provide you with a birds eye view of your finances all in one place. Founded in 2006, it was acquired by Intuit in 2009 and makes money by showing customized ads to users. Budgeting: Mint supports creating a budget whereas Personal Capital only tracks cash flow. Recommended Products: Mint suggests financial products that will save you money based on your existing accounts; however, they may earn a commission from the products they recommend. Credit Report Monitoring: this tool helps keep track of your quarterly credit score changes so you can make sure your credit is healthy. Canadian Support: Mint allows accounts denominated in Canadian dollars as well as US dollars. One of the core benefits of using a program like Mint or Personal Capital is the ability to view all of your account balances in one place with one login. Instead of logging into each bank, credit card, investment, and loan account separately to view the details, you can view them all on a dashboard on your phone or computer screen with either app. Mint’s layout is a little more intuitive, but the app is constantly riddled with connection errors, bugs, duplicate accounts, and other issues. In the decade I’ve been using Mint, I have had countless errors and problems. Personal Capital has been much more consistent and needs far fewer manual updates and corrections to keep my data flowing in correctly. 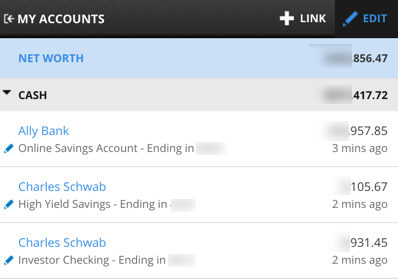 Both Mint and Personal Capital offer a feed with all of your transactions from linked accounts. Both attempt to categorize those transactions to help you better manage your money, but Mint does a much better job with its budgeting feature. 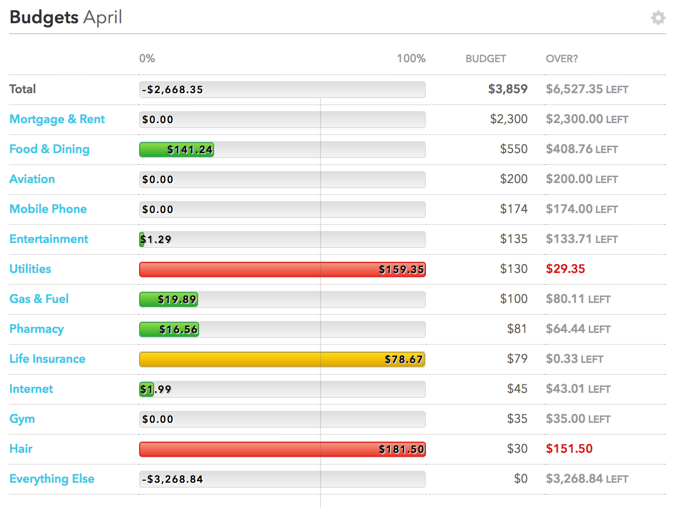 Personal Capital’s budgeting feature is essentially just a chart that shows your cash flow for a period of time. Mint, on the other hand, offers a strong budgeting feature and automatically categorizes transactions in each budget category. For dealing with budgets and spending, Mint is the stronger app. Where Personal Capital falls short in its budgeting tools, it makes up for in its investment tools and analysis. Mint offers a basic investment tracking page, but I have found errors in the past, for example when I stock I owned split and the cost basis was shown completely inaccurately. Personal Capital is all about investing. In fact, you can upgrade to a paid account (Mint only offers free accounts) to have direct access to a financial advisor to help you manage your investments through a hybrid robo-advisor platform. Even without the paid features, Personal Capital does a great job of analyzing your investments, showing you graphically how you might want to make changes and where you are losing the most to fees. I have saved over $300 per year in mutual funds fees thanks to the data from my Personal Capital account. 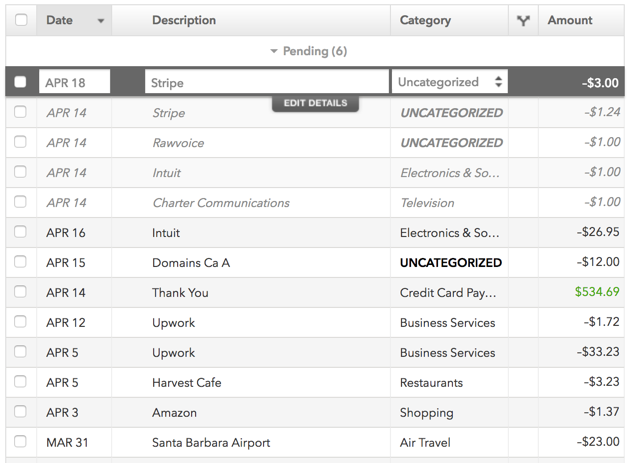 For the budgeting tools at Mint and cash flow summary in Personal Capital, the two apps attempt to automatically categorize and display every account’s transactions. Honestly, both apps offer something to be desired here. I have found new mobile only app Penny does a better job, though it does so with a simpler category system. Both Mint and Personal Capital are right more than they’re wrong, but each month without fail both have uncategorized and miscategorized transactions. Sometimes they chop off text in a funny place or replace the statement description with something completely unrelated. But, when push comes to shove, Mint offers a better interface for transactions and much better tools to review them and that gives it a little edge up. When Mint was a brand new startup, I knew I could email Stephen or one of the other customer service representatives to get my issue resolved, if not turned into a suggestion that was sent on to engineering. My results since Intuit purchased the company in 2009 have been worse and worse. Now when I find bugs and errors there appears to be no desire to fix them, they just offer inconvenient workarounds with no real effort to solve the root problem (which is probably affecting many other users as well). Personal Capital, on the other hand, has given me very few reasons to interact with support. It just works. However, its staff has reached out to me proactively to discuss my needs for its investment service. Personal Capital makes it really easy to find a person to help, unlike Mint, but sometimes the assistants can get a little too pushy trying to schedule a call with an investment advisor if you have more than $100,000 in investable assets in your account. In the Personal Capital vs Mint competition, both services offer a great set of tools completely free. However, thanks to its more reliable connections and interface, Personal Capital is the better of the two. If you specifically need help with budgeting, Mint is best. If you need help with investments, Personal Capital is far superior. If you have general personal finance management needs, Personal Capital does a fine job handling it.